You know how sometimes you just want to eat a crappy burger with nasty American cheese on top? Sometimes I’m so dedicated to this blog that I order a burger which I KNOW will be bad. Because someone has to review it, right? The world needs to know. So I “take one for the team” and eat a burger at a sports-type bar that clearly just added a generic “veggie burger” to its menu as an after-thought to capitalize on the increasing popularity of vegetarianism, without concern for the quality of said menu offering. This was one such burger. 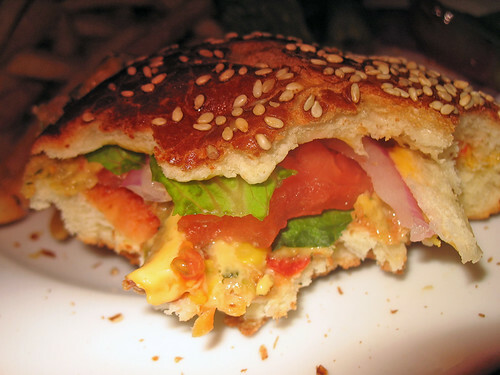 The bun was pretty standard for bar food. The toppings were your basic lettuce, tomato, and onion, with a pickle on the side. The fries were definitely the best part of the meal. 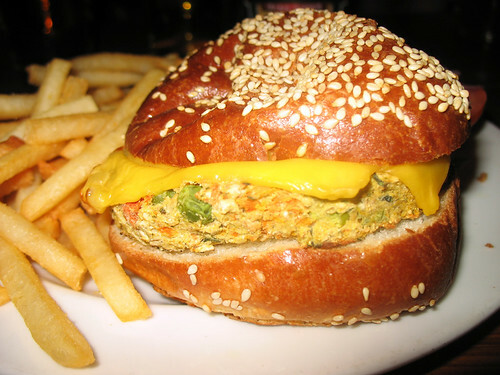 Obviously, no one comes to this bar just to eat the veggie burger. I’d love to do a survey someday to see how many veggie burgers places like this sell per week… I can’t imagine it’s a large number. Guess frozen burgers keep for months, though! But if you like sports bars filled with tons of people at 2am in Hell’s Kitchen, by all means do not let my review of one menu item deter you from enjoying that scene. Possibly best blog post opening ever. Being drunk for me involves finding three things in the fridge I would never ordinarily combine and eating them only to regret it the next morning. I really hate how many restos use frozen veggie burgers and then charge up to $10 for the cheap little things. Seriously, if they are going to buy those patties rather than making some tasty ones it should be on a value menu or something.